This fly is best fished on top or middle dropper with NO retrieve and allowed to "swing". Hook : 10 - 14. Thread : 8/0 Black Uni. Thorax : Very fine black dubbing. Wing case : Flexi in Orange. Thorax Cover : Parcel ribbon - split to show the three bands (light/dark/light). A type of parcel ribbon sourced from stationery shops especially around Xmas time, makes an excellent and very strong tying material. In particular the stripped versions can be split making very slim strips which give a 'ribbed' effect when wound around on the hook. Jardine Pupa / Grub. 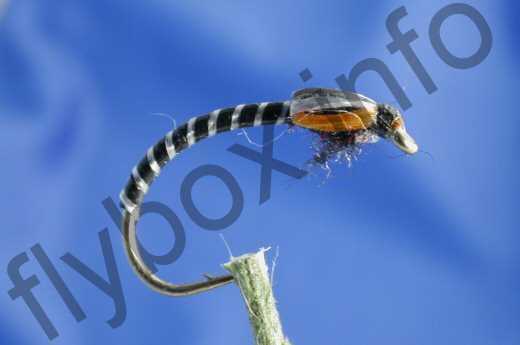 Currently there are no comments about the Parcel Ribbon Buzzer fly pattern from other fly fishermen yet.